And you’d be right to think that. But don’t I get points for seeing it now? Sure, I’ve heard about the movie. I mean, who isn’t familiar with the phrase, “I coulda been a contender. I coulda been somebody”? It came from this movie. And it was Mr. Myth, Mr. Method Actor, who uttered those now-famous lines. 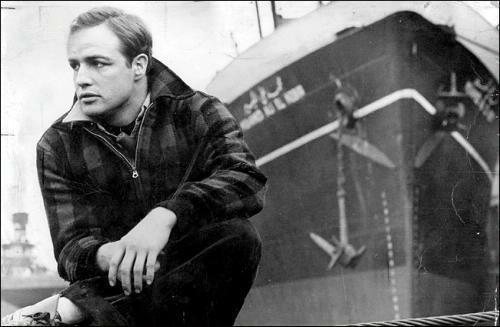 For the record, On the Waterfront was nominated for 12 Academy Awards. It won eight, including Best Picture, Best Director (Elia Kazan, 1909-2003), Best Actor (Brando), Best Story and Screenplay (Budd Schulberg, 1914-2009), and Best Supporting Actress (Eva Marie Saint). 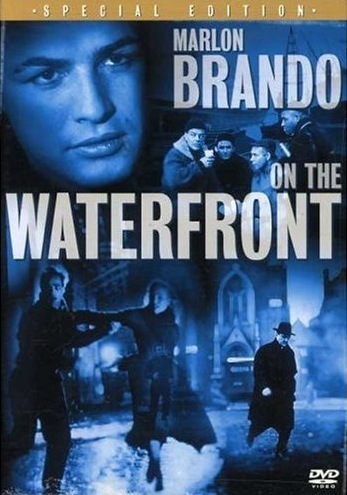 I’m going to call On the Waterfront an adaptation because it was (according to an FAQ on IMDB) based on a 24-part series of articles in the New York Sun by Malcolm Johnson. The series, titled “Crime on the Waterfront,” won the 1949 Pulitzer Prize for Local Reporting. So this is adaptation number 18 out of 27 Oscar-winning films, which means the percentage of movies based on novels, short stories, plays, or a series of newspaper articles stands at 67%. The locations are as grimy as the movie: rooftops, docks (it was filmed, literally, on the waterfront), bars, backrooms. It was shot in the winter, outdoors. Sometimes in the rain. Brando has a funny face, which he uses to look pained a lot. Lots of frowns, grimaces, sighs, etc. What an incredibly captivating movie! I noted only one instance of swearing, when Brando’s character tells the priest to “Go to hell.” For a bunch of longshoremen, they sure did talk like choir boys! Brando’s line, repeated twice, is only the second instance of swearing in any Oscar-winning Best Picture I’ve seen so far. (The first instance being Rhett Butler telling Scarlett O’Hara, “Frankly, my dear, I don’t give a damn” in the 1939 film Gone With the Wind.) These movies are terrific without the swearing. And, frankly, I always keep the movie The Departed in the back of my mind as I watch these old movies. A more violent, profane movie I don’t think I’ve ever seen than The Departed. Swearing has become gratuitous in modern-day movies. So much so that it has become, in effect, another character in the movie. I don’t like it. Everyone raves about Marlon Brando’s performance. It was good, yes. But everyone around him was astounding. Rod Steiger, Karl Malden, Eva Marie Saint – all were perfect. Their performances were powerful. I think they were the reason why Brando’s performance was so compelling. The “I coulda been a contender” scene (which took place in the back of a cab with Steiger and Brando) was one of the most memorable I’ve ever seen in my life. The entire movie is worth watching for that scene, alone. But watch the behind-the-scenes features on the DVD before you watch that scene. The interviews with Rod Steiger and Elia Kazan will give you tremendous insight into what made that scene great. The film has one major shortcoming, and it’s a fairly big one. The score – provided by Leonard Bernstein – is overpowering and distracting. Too loud. Too jarring. If there was a way to watch this without the music, it would have been a perfect film. As it is, it’s merely a great film. I love this movie so much. I really love the legendary scene in the cab too. I’d never considered the score of the film being overpowering… I’d like to re-watch it and pay particular attention to the music and see how it affects me. Good insight on that! I agree that the music was overpowering. And whereas Brando was really good, the others were better. I agree that Malden was superb. It took me some time to get into the story. It may have been due to audio issues I had. However, once it got going, it was great.